Priced below KBB Fair Purchase Price! BLACK CLOTH, Dual front impact airbags, Dual front side impact airbags, Exterior Parking Camera Rear, Heated Front Bucket Seats, Occupant sensing airbag, Overhead airbag, Power windows, Steering wheel mounted audio controls. Call Egolf Motors in Brevard at 828-884-4151 then x 1. Weve been serving customers in Western North Carolina and upstate South Carolina for over 40 years where you feel like family when you walk through the door. Odometer is 10629 miles below market average! Call Egolf Brevard at 828-884-4151. You make the drive, well make the deal and youll feel like family! Thanks to competitive pricing, admirable fuel economy and a well-appointed cabin, the 2015 Nissan Sentra is a respectable choice in the small sedan class. But know that its rivals offer many of the same attributes and are more rewarding to drive overall. All Nissan Sentra trim levels gain new standard equipment for 2015. Base S models get cruise control, a USB connection port, Bluetooth phone connection, steering wheel audio controls and automatic headlights, while the midgrade SV now has keyless entry and ignition, a color audio display, a rearview camera, Bluetooth audio connectivity, integrated smartphone apps, satellite radio and leather accents. The sporty 2015 Nissan Sentra SR also picks up the keyless ignition, along with heated front seats and heated outside mirrors. Rear disc brakes are now standard on the SR and SL trim levels. Finally, Nissan has modified the Sentra's front structure to improve crash safety and lengthened the side airbags. Upscale and spacious interior; priced lower than many rivals; high fuel economy; generous trunk space; useful infotainment features. There was a time when shopping in the affordable, compact-sedan segment required you to compromise on a number of things, namely space, comfort, features and style. 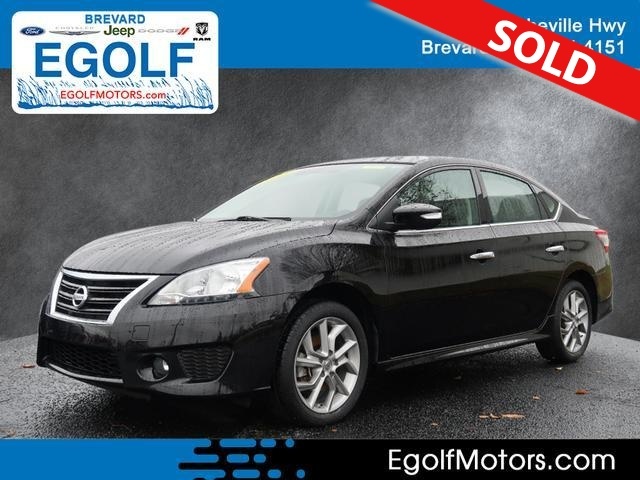 This is no longer the case, even if you're looking at a car like the 2015 Nissan Sentra, which is one of the less expensive models in this class. With its near-midsize car accommodations for passengers and shockingly large trunk, the Sentra, which earns an Edmunds.com "B" rating, will appeal to many shoppers, especially those who are downsizing from a bigger, more luxurious car. Although Nissan's entry is one of the slower cars in this class, it has a premium look and feel that other small sedans lack. Fully redesigned just a couple of years ago, this seventh-generation Sentra continues to evolve and grow in terms of refinement, enhanced features and driver engagement. For 2015, Nissan has made standard a long list of previously optional features. For example, cruise control, a USB/iPod connection, Bluetooth phone connectivity, steering wheel audio controls and automatic headlights all come in the base S trim. Things only get better from there. Step up to the midgrade SV and you get keyless entry/push-button ignition, a color infotainment display, a rearview camera, various smartphone applications (including hands-free texting), satellite radio, Bluetooth audio streaming and leather interior accents. Under the hood, the 2015 Sentra carries on with a 1.8-liter four-cylinder engine good for 130 horsepower. It provides only modest acceleration, but clearly the goal here is to compete with rivals that promise 40-mpg capability on the highway. And indeed, when equipped with the mpg-enhancing FE+ package, the Sentra S earns this same impressive EPA fuel economy rating. It's not really necessary to get the fuel miser model, though, since any 2015 Nissan Sentra with the continuously variable transmission (CVT) -- which Nissan offers in place of a conventional automatic transmission -- is EPA-rated for 39 mpg on the highway and 33 mpg combined. Still, the 2015 Nissan Sentra stakes a claim in a segment that is chock-full of great choices, each with its own advantages. The 2015 Ford Focus (heavily revised this year) and 2015 Mazda 3 both provide a more involving driving experience, along with a slightly more youthful vibe. And you can't leave out the Hyundai Elantra and Honda Civic, given their well-rounded nature and generous lists of standard features. Finally, the 2015 Volkswagen Jetta is notable because it's available as a gas-electric hybrid or with a new turbodiesel engine and delivers big mpg numbers either way. These are all formidable rivals, but if fuel economy and a spacious interior are your top priorities and your budget is tight, the 2015 Nissan Sentra is a smart alternative to the heavyweights in this class. A step up is the SV, which adds keyless entry and push-button ignition, upgraded cloth upholstery, a sliding front armrest, leather steering wheel and shifter, a 5-inch color infotainment display, rearview camera, NissanConnect integrated smartphone applications (including hands-free text messaging capability), satellite radio, Bluetooth audio streaming and a six-speaker sound system. Above this, the sporty SR gains bolder styling elements, including front and rear fascias, lower body skirting, foglights and a rear spoiler. Inside, it has premium cloth upholstery, silver trim and heated front seats. Functionally, it gains rear disc brakes, 17-inch alloy wheels and heated outside mirrors with integrated LED turn signals. The top-grade SL comes with the SV's standard features plus the functional equipment from the SR. It also boasts leather seating, dual-zone automatic climate control, an auto-dimming rearview mirror and simulated wood accents. The Cold Weather package (SV only) includes leather upholstery and heated front seats. The Style package (SV only) adds a sunroof, illuminated vanity mirrors, unique 16-inch alloy wheels and a rear spoiler. Optional for the SR and SL is the Premium package, which adds a sunroof, illuminated vanity mirrors, an eight-speaker Bose audio system, and for the SR only, leather seating (heated up front) and an auto-dimming rearview mirror. The Navigation package (available on all but the S) includes a navigation system, a larger 5.8-inch touchscreen display, satellite traffic and travel information, and voice recognition. Every 2015 Nissan Sentra gets a 1.8-liter four-cylinder engine rated at 130 hp and 128 pound-feet of torque. A six-speed manual transmission is standard on the base model, and a CVT is optional. All other Sentras have the CVT as standard. The EPA estimates that the six-speed manual Sentra will achieve 30 mpg combined (27 city/36 highway). Opting for the CVT ups economy to 33 combined (29/39). The FE+ S model adds 1 more mpg across the board, and thus its combined figure nets out to 34 mpg, making the Sentra one of the most fuel-efficient sedans in this class. On the other hand, in Edmunds testing, a Nissan Sentra SL accelerated from zero to 60 mph in 10.1 seconds, which is among the slowest times for this class of car. The 2015 Nissan Sentra comes standard with antilock brakes, stability control, tire-pressure monitoring, front-seat side airbags, full-length side curtain airbags and active front head restraints. A rearview camera and Nissan's Easy Fill Tire Alert system (which uses audible and visual signals to help you achieve the correct psi when adding air) are standard starting at the SV trim level. Most Sentra models come with rear drum brakes, but rear disc brakes are standard on the SR and SL. However, in Edmunds brake testing, a Sentra with the less costly rear drum brakes stopped from 60 mph in 118 feet, a better than average distance for the segment. In government crash tests, the 2015 Sentra earned an overall rating of four stars (out of a possible five), with four stars for frontal impact protection and five stars for side-impact protection. The Insurance Institute for Highway Safety awarded the 2015 Sentra its best rating of "Good" in its moderate-overlap and small-overlap frontal offset impact tests. The Sentra also earned a "Good" rating in the side-impact, roof-strength and seat and head restraint (whiplash protection) tests. Taller drivers will welcome the Nissan Sentra's unexpectedly spacious front seats. Rear-seat passengers aren't left out either. Indeed, the rear accommodations are so spacious that the Sentra practically feels like a midsize sedan from the backseat. Although the Sentra's conservative overall interior design isn't going to wow you, everything in the cabin is solidly screwed together. Standout features include optional keyless entry/ignition that was once a luxury-car item, as well as smartphone app integration (NissanConnect), which allows you to do Google searches via the car's 5.8-inch touchscreen interface in navigation-equipped models. In Sentras without navigation, you can still stream Internet radio (Pandora or iHeartRadio) and monitor text messages and social media. Luggage capacity is generous for the class. At 15.1 cubic feet, the Sentra's trunk volume is comparable to that of many midsize sedans. The 2015 Nissan Sentra's 130-hp engine is pleasantly muted while accelerating moderately and cruising at freeway speeds. The Sentra's CVT is one of the better ones out there, offering little of the strangely elastic "rubber-banding" sensation some of these transmissions suffer from. Part of the reason for this is that Nissan has programmed in simulated stepped-shifting as you would get with a traditional automatic transmission. This would seem to contradict the CVT's fuel economy priority, but depending on selected mode (D, L, O/D off, Eco, Sport) and throttle position, the transmission tailors its behavior accordingly. While it's hard to predict its varied responses, we're sure you'll find a mode that suits your expectations and needs. The Sentra finds an agreeable middle ground in the ride quality department. It's not as harsh as some sportier alternatives, and for the most part, the ride is fairly smooth and sophisticated. Handling around turns is respectable, and the Sentra has responsive, reassuring steering. The brakes are also more than adequate and provide plenty of stopping power along with an intuitive pedal feel.